Sometimes you just need a big ol’ bowl of soup. I am a soup girl. 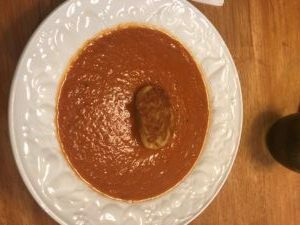 I eat it year-round, even living on the face of the sun in Arizona, and I love Paradise Bakery’s Fire-Roasted Tomato Soup. Unfortunately, they were bought out by Panera Bread. Nothing against Panera, but their version just isn’t the same for my taste buds. 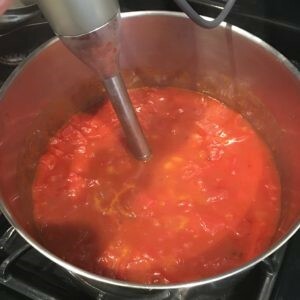 This soup was so good that even my tomato-hating husband liked it! That is a victory, let me tell you. 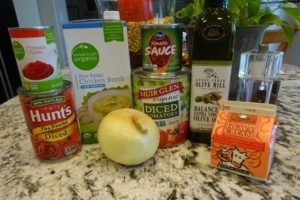 This soup, courtesy of Chef in Training, is perfect for those cold winter days at home or on an RV adventure. Her recipes never fail. Turns out, she loves Paradise Bakery’s soup as much as I do and is talented enough to figure out a copycat recipe. Best of all, it’s RV-friendly! Are you the only soup fan in your family? Sadly, I can relate — not everyone in my house likes soup as much as I do. I usually end up making a batch and freezing most of it for later. Having a few freezer soups on hand for RV adventures can be a convenience. Or consider making a batch for a quick meal when you get home from an RV trip and are busy unpacking. Also, I’m a Pioneer Woman junkie. I like her easy-going demeanor and how vividly she explains the recipes on her show. She recently had an episode dedicated entirely to soups; it’s like she was talking directly to me! I pinned every recipe from that episode. 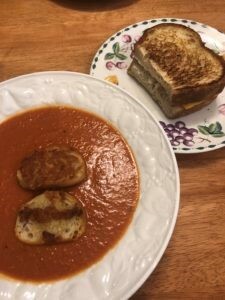 She showcased a tomato soup recipe that looked divine, complete with homemade Parmesan croutons. As I said above, the Pioneer Woman’s homemade croutons were calling my name. I can’t completely tell you why, either. I’m the person at the table that flicks the croutons off the salad. For me, they are normally just a wasted starch. Yet here I was sitting on the couch, computer in hand, salivating at these homemade croutons. Maybe it was the Parmesan cheese or how easy the recipe looked; even better, she talked about how easy they were to freeze. Wait, what? I can freeze them and put them on my soup or salad anytime I wanted? I’m in. 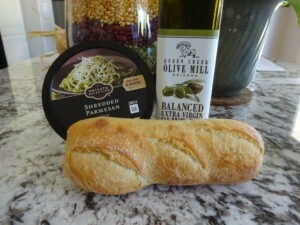 I found a small baguette at the grocery store. Since I’m not normally a crouton girl, I thought maybe the full baguette slices would be too big. So, after slicing the baguette, I cut each slice in half. After slicing, I laid them out on some foil, and then brushed olive oil on each one. I then put a small pile of Parmesan cheese in the heated pan and placed each slice on top of the cheese. 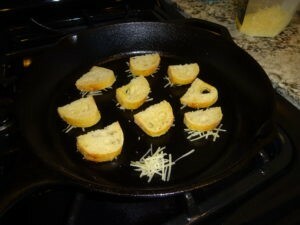 While the bread was browning nicely with the cheese, I brushed olive oil and added Parmesan to the top side. It’s a careful flip; the first time I tried was too soon and I had random pieces of Parmesan scattered about the pan. Do a gentle check for readiness before flipping. The entire process was under five minutes. 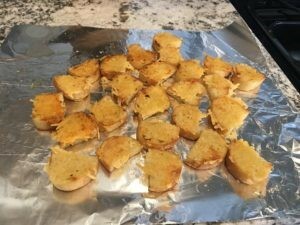 I placed the finished croutons back on the foil for cooling. I wrapped up several for the week’s meals and froze the rest. 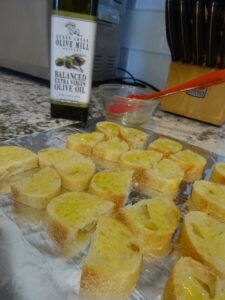 Brush bread slices with olive oil. Place small piles of Parmesan cheese and gently press bread into it. Cook until browned to your liking and turn over for second side browning. You can freeze any leftovers in a standard freezer bag. Now it’s time to make your soup. When I’m making something for the first time, I like to get all the parts and pieces set up in the order I’ll need them. It’s my “new recipe” assembly line. I opened all the cans, minced the garlic, and diced the onion. The most time-consuming part of the recipe was finely dicing the onion, which is not a pretty sight. Each time, I start with high hopes that I’ll cut the slices perfectly straight and dice them just like you see on TV. Instead, I end up with lopsided cuts and random piles of onions that need extra dicing. I’m happy to say I am improving with a more uniform cut, though. Must keep practicing. I’ve learned when sauteing onions to not to be in a hurry. It’s also the secret to sneaking more onions into food with my picky man. The recipe called for them to be translucent, so I set the timer for five minutes. After they were ready, I added the garlic for a couple more minutes. When the onions and garlic are cooked, it’s time for the cans. I dumped the diced tomatoes, tomato sauce, and tomato paste in the pot, followed by the water and chicken broth. I stirred it frequently until it reached a boil, and then I covered it to simmer for 30 minutes. The waiting is the hardest part for me when I make soup. I admit that I did peek at it a few times while it simmered. I was ready to eat! The last part is adding salt, pepper, and cream. Then simmer for 10 more minutes. When the timer dinged, I turned off the heat and pureed it with my handy-dandy emulsion blender. The emulsion blender is the only extra appliance needed for this recipe. If you don’t have one in your RV, I’m sure a potato masher would work just fine. Or, you could carefully put it in the blender (Doesn’t every RV have a blender for making margaritas?). 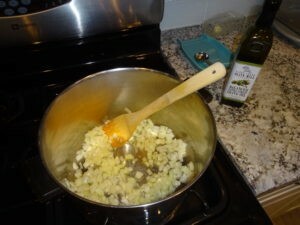 Saute onion in olive oil in a large pot until almost translucent. Add garlic and saute a couple of minutes longer. Add tomatoes, tomato sauce, tomato paste, water, and chicken broth. Stir to combine and until it reaches a boil. Reduce heat, cover, and let simmer for 30 minutes. Puree soup as necessary to reach desired constancy. Add salt, pepper, and cream and simmer for an additional 10 minutes. 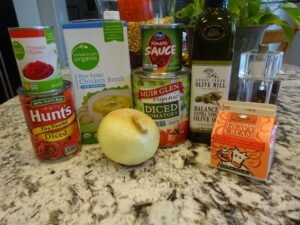 I encourage you to try making an RV-friendly soup like this for your next trip. For some of my favorite RV-friendly soup recipes, check out my Pinterest board, Gimme a Soup Spoon. Enjoy! I’m Maureen Milne, F446881 . I’m a mom of two (now grown-up!) boys, ages 26 and 24. My husband, Mark, and I have been married 30 years. We are an adventurous family; our friends call us “X-Games.” We are avid hikers, cyclists, and skiers (both snow and water). Mark does triathlons and we run in 4-5 races a year. We’ve been RVing together since we were teenagers in 1984. I’m a three-year thyroid cancer survivor, which has given me a new perspective on life. I share our RVing adventures on my blog, M&M Hit The Road. I also post stories and pictures on Facebook and Instagram.